Offer condition: T&Cs: £20 off your second, third, fourth and fifth grocery shops with waitrose.com: This offer code is available on fifth grocery order only. Orders must be placed for delivery by 30 November 2018 to qualify for this offer. Minimum spend on online groceries at waitrose.com of £80 required on each order to qualify for this offer. Excluded Items: infant milk formula (0-6 months), single use carrier bags, tobacco, stamps, mobile top ups, e-Top up vouchers, lottery tickets, gift vouchers, cash back, car park charges, fuel and delivery charges. Excludes alcohol purchases in Scotland. Other items may also be excluded at the discretion of Waitrose. Offer not redeemable in branch or in conjunction with any other offer or service. One redemption on each promotional code per household per day. Offer can be withdrawn at any time without notice. Online Grocery Orders: Selected postcodes. Subject to availability. Do not miss another Waitrose voucher! Simply leave your e-mail address and we'll always keep you informed of new vouchers for Waitrose. Offer condition: £20 off your second, third, fourth and fifth grocery shops with waitrose.com: This offer code is available on fourth grocery order only. Orders must be placed for delivery by 30 November 2018 to qualify for this offer. Minimum spend on online groceries at waitrose.com of £80 required on each order to qualify for this offer. Excluded Items: infant milk formula (0-6 months), single use carrier bags, tobacco, stamps, mobile top ups, e-Top up vouchers, lottery tickets, gift vouchers, cash back, car park charges, fuel and delivery charges. Excludes alcohol purchases in Scotland. Other items may also be excluded at the discretion of Waitrose. Offer not redeemable in branch or in conjunction with any other offer or service. One redemption on each promotional code per household per day. Offer can be withdrawn at any time without notice. Online Grocery Orders: Selected postcodes. Subject to availability. Offer condition: £20 off your second, third, fourth and fifth grocery shops with waitrose.com: This offer code is available on third grocery order only. Orders must be placed for delivery by 30 November 2018 to qualify for this offer. Minimum spend on online groceries at waitrose.com of £80 required on each order to qualify for this offer. Excluded Items: infant milk formula (0-6 months), single use carrier bags, tobacco, stamps, mobile top ups, e-Top up vouchers, lottery tickets, gift vouchers, cash back, car park charges, fuel and delivery charges. Excludes alcohol purchases in Scotland. Other items may also be excluded at the discretion of Waitrose. Offer not redeemable in branch or in conjunction with any other offer or service. One redemption on each promotional code per household per day. Offer can be withdrawn at any time without notice. Online Grocery Orders: Selected postcodes. Subject to availability. Offer condition: £40 off your first two online grocery orders at waitrose.com. Offer available on first time online grocery orders only. Both orders must be placed for delivery by 24 October 2018 to qualify for this offer. Minimum spend on online groceries at waitrose.com of £80 required on each order to qualify for this offer. Excluded Items: infant milk formula (0-6 months), single use carrier bags, tobacco, stamps, mobile top ups, e-Top up vouchers, lottery tickets, gift vouchers, cash back, car park charges, fuel and delivery charges. Excludes alcohol purchases in Scotland. Other items may also be excluded at the discretion of Waitrose. Offer not redeemable in branch or in conjunction with any other offer or service. One redemption per household. Offer can be withdrawn at any time without notice. Online Grocery Orders: Selected postcodes. Subject to availability. *Online Grocery Orders: Minimum spend of £60 applies on online grocery deliveries. Minimum spend of £40 applies on Click & Collect in-store collections. Selected postcodes. Subject to availability. Free delivery excludes our shop in branch service. Offer condition: £20 off your second, third, fourth and fifth grocery shops with waitrose.com: This offer code is available on second grocery order only. Orders must be placed for delivery by 30 November 2018 to qualify for this offer. Minimum spend on online groceries at waitrose.com of £80 required on each order to qualify for this offer. Excluded Items: infant milk formula (0-6 months), single use carrier bags, tobacco, stamps, mobile top ups, e-Top up vouchers, lottery tickets, gift vouchers, cash back, car park charges, fuel and delivery charges. Excludes alcohol purchases in Scotland. Other items may also be excluded at the discretion of Waitrose. Offer not redeemable in branch or in conjunction with any other offer or service. One redemption on each promotional code per household per day. Offer can be withdrawn at any time without notice. Online Grocery Orders: Selected postcodes. Subject to availability. Offer condition: £20 off your second, third, fourth and fifth grocery shops with waitrose.com: This offer code is available on fifth grocery order only. Orders must be placed for delivery by 31 October 2018 to qualify for this offer. Minimum spend on online groceries at waitrose.com of £80 required on each order to qualify for this offer. Excluded Items: infant milk formula (0-6 months), single use carrier bags, tobacco, stamps, mobile top ups, e-Top up vouchers, lottery tickets, gift vouchers, cash back, car park charges, fuel and delivery charges. Excludes alcohol purchases in Scotland. Other items may also be excluded at the discretion of Waitrose. Offer not redeemable in branch or in conjunction with any other offer or service. One redemption on each promotional code per household per day. Offer can be withdrawn at any time without notice. Online Grocery Orders: Selected postcodes. Subject to availability. Offer condition: £20 off your second, third, fourth and fifth grocery shops with waitrose.com: This offer code is available on fourth grocery order only. Orders must be placed for delivery by 31 October 2018 to qualify for this offer. Minimum spend on online groceries at waitrose.com of £80 required on each order to qualify for this offer. Excluded Items: infant milk formula (0-6 months), single use carrier bags, tobacco, stamps, mobile top ups, e-Top up vouchers, lottery tickets, gift vouchers, cash back, car park charges, fuel and delivery charges. Excludes alcohol purchases in Scotland. Other items may also be excluded at the discretion of Waitrose. Offer not redeemable in branch or in conjunction with any other offer or service. One redemption on each promotional code per household per day. Offer can be withdrawn at any time without notice. Online Grocery Orders: Selected postcodes. Subject to availability. Offer condition: £20 off your second, third, fourth and fifth grocery shops with waitrose.com: This offer code is available on third grocery order only. Orders must be placed for delivery by 31 October 2018 to qualify for this offer. Minimum spend on online groceries at waitrose.com of £80 required on each order to qualify for this offer. Excluded Items: infant milk formula (0-6 months), single use carrier bags, tobacco, stamps, mobile top ups, e-Top up vouchers, lottery tickets, gift vouchers, cash back, car park charges, fuel and delivery charges. Excludes alcohol purchases in Scotland. Other items may also be excluded at the discretion of Waitrose. Offer not redeemable in branch or in conjunction with any other offer or service. One redemption on each promotional code per household per day. Offer can be withdrawn at any time without notice. Online Grocery Orders: Selected postcodes. Subject to availability. Offer condition: T&Cs: £20 off your second, third, fourth and fifth grocery shops with waitrose.com: This offer code is available on second grocery order only. Orders must be placed for delivery by 31 October 2018 to qualify for this offer. Minimum spend on online groceries at waitrose.com of £80 required on each order to qualify for this offer. Excluded Items: infant milk formula (0-6 months), single use carrier bags, tobacco, stamps, mobile top ups, e-Top up vouchers, lottery tickets, gift vouchers, cash back, car park charges, fuel and delivery charges. Excludes alcohol purchases in Scotland. Other items may also be excluded at the discretion of Waitrose. Offer not redeemable in branch or in conjunction with any other offer or service. One redemption on each promotional code per household per day. Offer can be withdrawn at any time without notice. Online Grocery Orders: Selected postcodes. Subject to availability. Offer condition: T&Cs: £20 off your second, third, fourth and fifth grocery shops with waitrose.com: This offer code is available on fifth grocery order only. Orders must be placed for delivery by 30 September 2018 to qualify for this offer. Minimum spend on online groceries at waitrose.com of £80 required on each order to qualify for this offer. Excluded Items: infant milk formula (0-6 months), single use carrier bags, tobacco, stamps, mobile top ups, e-Top up vouchers, lottery tickets, gift vouchers, cash back, car park charges, fuel and delivery charges. Excludes alcohol purchases in Scotland. Other items may also be excluded at the discretion of Waitrose. Offer not redeemable in branch or in conjunction with any other offer or service. One redemption on each promotional code per household per day. Offer can be withdrawn at any time without notice. Online Grocery Orders: Selected postcodes. Subject to availability. Offer condition: T&Cs: £20 off your second, third, fourth and fifth grocery shops with waitrose.com: This offer code is available on fourth grocery order only. Orders must be placed for delivery by 30 September 2018 to qualify for this offer. Minimum spend on online groceries at waitrose.com of £80 required on each order to qualify for this offer. Excluded Items: infant milk formula (0-6 months), single use carrier bags, tobacco, stamps, mobile top ups, e-Top up vouchers, lottery tickets, gift vouchers, cash back, car park charges, fuel and delivery charges. Excludes alcohol purchases in Scotland. Other items may also be excluded at the discretion of Waitrose. Offer not redeemable in branch or in conjunction with any other offer or service. One redemption on each promotional code per household per day. Offer can be withdrawn at any time without notice. Online Grocery Orders: Selected postcodes. Subject to availability. Offer condition: T&Cs: Terms and conditions: £20 off your second, third, fourth and fifth grocery shops with waitrose.com: This offer code is available on second grocery order only. Orders must be placed for delivery by 30 September 2018 to qualify for this offer. Minimum spend on online groceries at waitrose.com of £80 required on each order to qualify for this offer. Excluded Items: infant milk formula (0-6 months), single use carrier bags, tobacco, stamps, mobile top ups, e-Top up vouchers, lottery tickets, gift vouchers, cash back, car park charges, fuel and delivery charges. Excludes alcohol purchases in Scotland. Other items may also be excluded at the discretion of Waitrose. Offer not redeemable in branch or in conjunction with any other offer or service. One redemption on each promotional code per household per day. Offer can be withdrawn at any time without notice. Online Grocery Orders: Selected postcodes. Subject to availability. 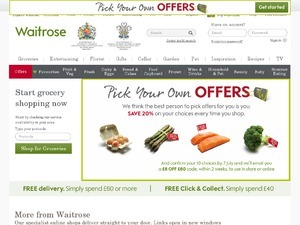 Offer condition: T&Cs: £100 off your first five online grocery orders at waitrose.com. Offer available on first time online grocery orders only. First order must be placed for delivery by 22 August 2018, all subsequent orders must be placed for delivery by 30 September 2018 to qualify for this offer. Minimum spend on online groceries at waitrose.com of £80 required on each order to qualify for this offer. Excluded Items: infant milk formula (0-6 months), single use carrier bags, tobacco, stamps, mobile top ups, e-Top up vouchers, lottery tickets, gift vouchers, cash back, car park charges, fuel and delivery charges. Excludes alcohol purchases in Scotland. Other items may also be excluded at the discretion of Waitrose. Offer not redeemable in branch or in conjunction with any other offer or service. One redemption per household. Offer can be withdrawn at any time without notice. Online Grocery Orders: Selected postcodes. Subject to availability. *Online Grocery Orders: Minimum spend of £60 applies on online grocery deliveries. Minimum spend of £40 applies on Click & Collect in-store collections. Selected postcodes. Subject to availability. Free delivery excludes our shop in branch service. Offer condition: T&Cs: £20 off your second, third, fourth and fifth grocery shops with waitrose.com: This offer code is available on second grocery order only. Minimum spend on online groceries at waitrose.com of £80 required with each shop to qualify for this offer. Offer not redeemable in branch or in conjunction with any other offer or service. Excluded Items: infant milk formula (0-6 months), single use carrier bags, tobacco, stamps, mobile top ups, e-Top up vouchers, lottery tickets, gift vouchers, cash back, car park charges, fuel and delivery charges. Other items may also be excluded at the discretion of Waitrose. One redemption on each promotional code per household per day. All orders must be delivered before 30 June 2018 to qualify for this offer. Online Grocery Orders: Selected postcodes. Subject to availability. Free delivery excludes our shop in branch service. Offer condition: T&Cs: £100 off over your first five online grocery orders at waitrose.com. Offer available on first time online grocery orders only. First order must be placed for delivery by 29 May 2018 to qualify for this offer. Minimum spend on online groceries at Waitrose of £80 required on each order to qualify for this offer. Offer not redeemable in branch or in conjunction with any other offer or service. One redemption per household per day. Items excluded: infant formula, tobacco, stamps. Other items may also be excluded at the discretion of Waitrose. Offer can be withdrawn at any time without notice. Online Grocery Orders: Selected postcodes. Subject to availability. Offer condition: £30 off over your first two online grocery orders at waitrose.com. Offer available on first time online grocery orders only. All orders must be placed for delivery by 13 April 2018 to qualify for this offer. Minimum spend on online groceries at Waitrose of £80 required on each order to qualify for this offer. Offer not redeemable in branch or in conjunction with any other offer or service. One redemption per household per day. Items excluded: infant formula, tobacco, stamps. Other items may also be excluded at the discretion of Waitrose. Offer can be withdrawn at any time without notice. Online Grocery Orders: Selected postcodes. Subject to availability. Latest voucher code valid at a time of promo publication was entered to be working from 2018-09-25.